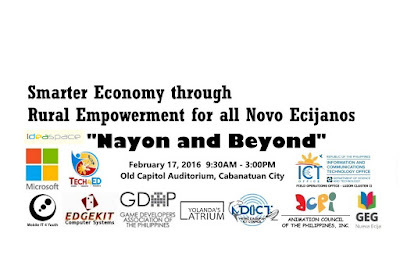 We proudly sponsor this event to be held in Cabanatuan City, Nueva Ecija on 17 February 2016 from 9:30AM to 3PM in line with our vision of a progressive country strengthened by countryside with empowered rural communities. Please register and participate in this event. Don't miss the chance to listen to the discussions and exchange ideas and viewpoints with some of the most notable speakers and experts in the technology and its impact and contribution to our society, especially on rural empowerment and development. 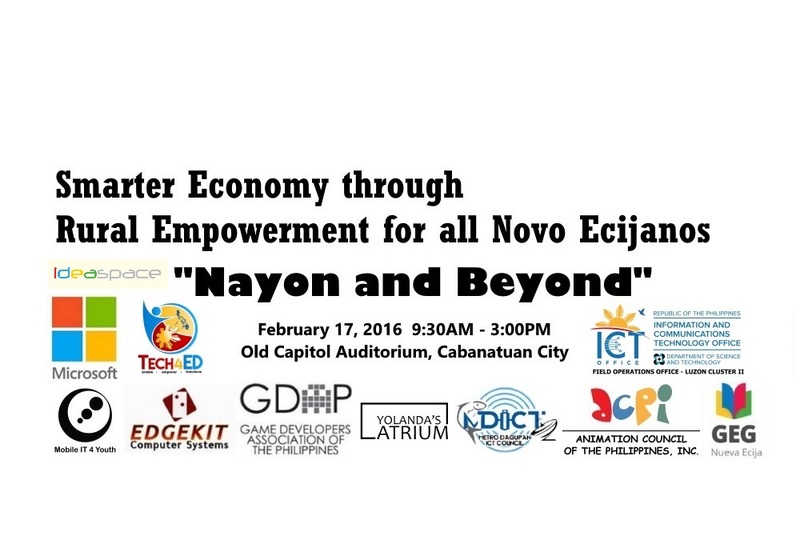 We are humbled with the overwhelming support for this event also by Microsoft Philippines, Tech4Ed, MobilityIT 4 Youth, Game Developers Association of the Philippines (GDAP), Metro Dagupan ICT Council (MDICT), ICT Office, Google Educators Group (GEG) Nueva Ecija, Animation Council of the Philippines and Yolanda's Atrium. We look forward to sponsor and participate in more events like this that will bring the technology and opportunity awareness to our fellow Filipinos in the various provinces of the Philippines.